Choose the right stretch film for the optimum load stability/transport protection. We guarantee lowest possible price per pallet without compromising with load integrity. Our extensive knowledge of wrapping films combined with our high quality packaging machines provides you with the best possible wrapping solution. Machine and film kept together as one – leaving no room for mistakes. We select a film which is strong enough to withstand the handling by people and machinery during transportation. Our selected films are designed with the optimum balance between elasticity and holding force which is critical in obtaining the right load stability. 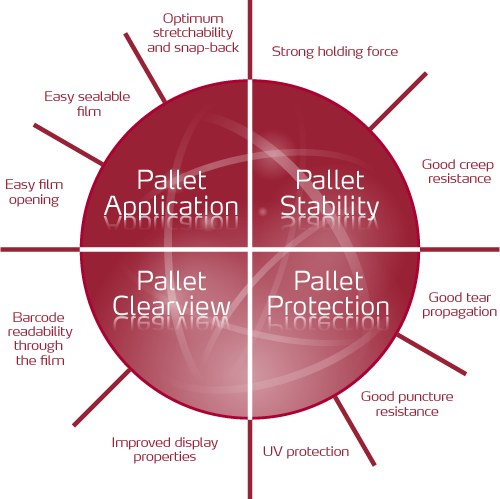 Stretch hood films are well suited for applications where pallet loads require a 5-sided protection, where products are sensitive to heat, and where loads encounter stress during shipment. Stretch hood films are available transparent as well as in colors and can be printed to give good brand exposure and thus improved marketability. Whether displayed in retail warehouses or transported on open trucks, stretch hood wrapping provides a clear view of product name and logo allowing you to seize brand awareness. Lachenmeier Provides Optimum Pallet Load Stability By Doing More with less..
Are you sure that your film provides you optimum performance at minimum cost? Let us help you review and assesss your existing packaging process.